The star-struck gangster isn’t exactly a new trope – think Cole Porter’s classic Kiss Me Kate or Barry Sonnenfeld’s Get Shorty – but there’s still something different about HBO’s new dark comedy Barry, which follows the title character (played by Bill Hader) as he becomes obsessed with dreams of stardom while trying to shed his former identity as a ruthlessly effective hit man. Perhaps that’s because it’s one of the first attempts (that I can think of, at any rate) to translate this idea to the medium of television. 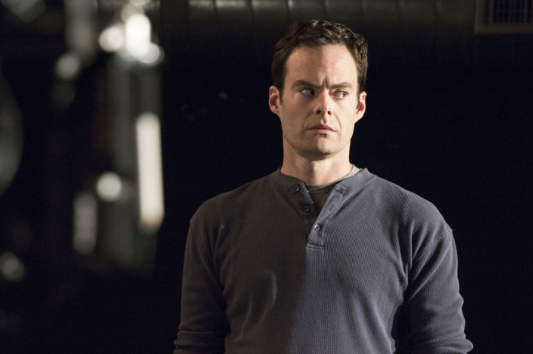 Barry is an intriguing, if uneven, show that gives Hader a chance to keep moving past the broad comic roles that initially earned him fame. Co-created by Hader and Alec Berg, the show follows its eponymous character from Cleveland to Los Angeles, where he’s been hired to kill a dim-witted wannabe actor named Ryan (Tyler Jacob Moore) who’s having an affair with the wife of Chechen mob boss Goran (Glenn Fleshler). Barry tracks his quarry to an acting class led by Gene Cousineau (Henry Winkler), and, when he’s forced to pretend to be there as a prospective student and participate in some onstage exercises, the experience awakens something in him, reinforcing his pre-existing qualms about continuing to murder people for a living. When the Chechens, led by Goran’s amiably psychopathic henchman NoHo Hank, end up killing Ryan anyway, the subsequent murder investigation leads to complications for Barry, his employers, and his handler, Monroe Fuches (Stephen Root). Barry is at its best when it serves as a showcase for its talented cast. Hader was one of the linchpins of Saturday Night Live for years, and that was in large part due to his ability to impart a degree of subtlety to the show’s broad style of comedy. He’s a pleasure to watch here, especially during his scenes in Gene’s acting class. You can sense that Barry’s coming alive in a way that he hasn’t in a long time, but at the same time there’s a sense of barely suppressed panic in his quick, darting looks at his classmates and his stiffness onstage. Outside of those scenes, he’s laconic and deadpan, barely breaking a sweat even as the Chechens torture Fuches and threaten both of their lives. That’s not so much because he’s possessed of a James Bondian cool as that he’s clearly still dealing with PTSD from his time in the Marines. Besides Hader, the show also does right by Winkler and Root, who both seem to relish their respective roles. Winkler’s Gene has a delightful scene in the fourth episode with Moss (Paula Newsome, in an enjoyable performance), the detective who’s been assigned to solve Ryan’s murder: he invites her to dinner on the pretense of wanting to give her information about the case, then ends up convincing her to stay by promising to let her kick him in the balls if it isn’t the best meal she’s ever had. Winkler and Newsome manage to work up a weird chemistry in the midst of their sparring, and it’s fun to watch these actors work on each other. Root, meanwhile, feels right at home in this dark comedy. At one point, while he’s being held hostage by the Chechens, Fuches meets a legendary assassin who’s been brought over from the motherland for the express purpose of killing him and Barry. Fuches proceeds to talk the killer’s ear off until he drives him to despair and gets him to shoot himself, which ultimately earns Fuches his freedom. Anthony Carrigan plays the unsettlingly upbeat NoHo, but he plays well off his more deadpan castmates. Good performances aside, Barry still struggles with some tonal issues. Perhaps the weakest link in the cast is Sarah Goldberg’s Sally, who’s Barry’s classmate and, briefly, lover. Goldberg does her best with the material, but it’s kind of hopeless: I’m not sure what Berg and Hader, who are credited as the main writers for all eight episodes of the series’ first season, were going for with her character, but it’s hard to avoid the feeling that she’s a victim of inept writing by two men who can’t quite nail down their characterization because of her gender. Whereas Barry’s obsession with acting plays as comedy – he’s on the verge of picking off his next target, but he leaves his stakeout because it’s time to get to class – Sally’s comes across as sad and self-absorbed. 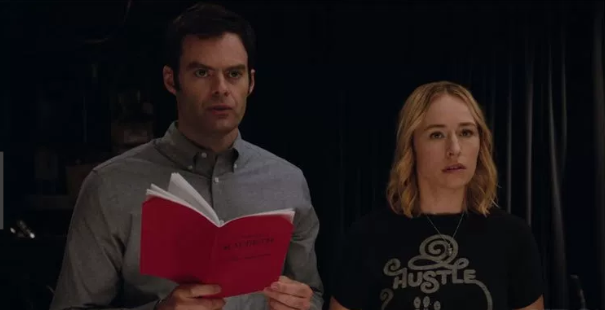 Berg and Hader give us scenes that show her having to audition in front of a much more successful former castmate and getting dropped by her sort-of agent when she won’t sleep with him, which are meant to render her more sympathetic, but it doesn’t work. Instead they feel like a series of glimpses into a different show that happens to feature the same character. The show also primarily depicts her as an object of desire for Barry, which skews how we perceive and understand her actions and motives. Perhaps the best example of this comes when Barry suggestively pulls her away from a conversation she's having with a man whom she meets at a party and is interested in; she and Barry have recently had a one-night stand, and he's convinced that she's now his girlfriend. Normally, we'd view such behavior on Barry's part as naive and misguided at best, troubling and creepy at worst (particularly given what we know about his fragile mental state). However because we primarily see Sally through Barry's perspective, her rejection of him comes across as cruel and selfish. The problem with Sally points to the one major thing that’s holding the show back, which is its inability to reconcile its two halves in a satisfying way. The satire of petty, self-centered L.A. types feels much less interesting and important than the dark comedy surrounding Barry and Fuches’s misadventures with the Chechen mob. Gene is something of a fraud – we get a glimpse of one of his auditions, for the role of an extra waiting in a line, that points up just how disproportionate his students’ reverence for him is to his actual professional status – but Winkler knows how to play that off as comedy, whereas the rest of the class doesn’t always manage that feat. We’re meant to laugh at the idea that Barry sees this group of self-absorbed wannabes as guides to a revelatory experience that introduces him to the magic of acting, but there’s a sadness to the scenario that occasionally feels mean-spirited. That’s especially true when it comes to the way that Barry handles his PTSD. In the fifth episode, he snaps when his classmates dismiss Macbeth as morally irredeemable because he’s murdered people. It’s instructive to contrast how Hader and Berg treat Barry with the way that You’re the Worst chose to treat veteran Edgar’s trauma as a source of purposely tasteless humor, right up until the time when it devoted an entire episode to exploring that trauma with a heretofore absent seriousness. Barry doesn’t fully commit in either direction, hinting at its lead’s demons without fully exploring them, and that also contributes to some unwelcome confusion in terms of tone. If Barry can find a way to reconcile its various elements into a more cohesive whole, it may well become one of the most effective dark comedies currently running.